TAMPA, FL, April 25, 2018 – Choice Hotels International, Inc. (NYSE: CHH), one of the world’s leading hotel companies, today announced that it has selected NovaCHARGE as a Qualified Vendor for providing Choice Hotels properties with Electric Vehicle (EV) charging solutions. Choice Hotels franchises over 6,800 hotels representing more than 500,000 rooms worldwide through its12unique brands, including Ascend Hotel Collection, Cambria Hotels, Comfort, Sleep Inn, Quality, Clarion, MainStay Suites, Suburban Extended Stay Hotel, WoodSpring Suites, Econo Lodge and Rodeway Inn. As a premier provider of EV charging infrastructure for Choice Hotels, NovaCHARGE will be offering customized EV charging units to conveniently and visibly promote each unique hotel brand to its employees and guests. NovaCHARGE’s flexible business models will allow hotel management to offer a wide range of for-pay, valet or complimentary EV charging services, while differentiating itself. NovaCHARGE will be kicking off this new relationship at the annual Choice Hotels convention in Las Vegas, to be held May 1-3, 2018. Choice Hotels International, Inc. (NYSE: CHH) is one of the world’s largest hotel companies. With over 6,800 hotels franchised in more than 40 countries and territories, Choice Hotels International represents more than 500,000 rooms around the globe, and as of February 1, 2018, more than 1,000 hotels were in its development pipeline. Our company’s Ascend Hotel Collection®, Cambria® Hotels, Comfort Inn®, Comfort Suites®, Sleep Inn®, Quality®, Clarion®, MainStay Suites®, Suburban Extended Stay Hotel®, WoodSpring Suites®, Econo Lodge®, Rodeway Inn®, and Vacation Rentals by Choice Hotels® brands provide a spectrum of lodging choices to meet guests’ needs. With more than 35 million members, our Choice Privileges® rewards program enhances every trip a guest takes, with benefits ranging from every day rewards to exceptional experiences, starting right when they join. All hotels and vacation rentals are independently owned and operated. Visit us at www.choicehotels.com for more information. NovaCHARGE, LLC was founded in 2008 to address the growing need for a next-generation EV charging infrastructure. As a national leading provider of networked and non-networked EV charging solutions, NovaCHARGE has the broadest experience of any EV equipment provider in the hospitality and tourism markets. Headquartered in Florida, NovaCHARGE is a Certified Minority/Woman owned business. For more information, please visit www.NovaCHARGE.net. TAMPA, FL – April 20, 2017 – NovaCHARGE LLC, a leading provider of electric vehicle charging solutions, deployed their NC-5000 chargers with the Tampa Downtowner, a free electric shuttle service, when it launched October 20, 2016. Since that time, the NC-5000 chargers have been kept busy, charging approximately 96 hours a day, collectively. Tampa Downtowner has 12 electric shuttles, and has served 82,076 passengers, driving 97,440 miles in the six months it has been in service. A recent Downtowner survey shows that riders use the service for work commute, errands and leisure activities. NC-5000 chargers feature a rugged housing and a hardened rubber charging connector, making it an ideal solution for outdoor applications, like that of the Tampa Downtowner service. Built for reliability and heavy usage, these high-performance units sport a compact design and fully customizable front panel, enabling businesses to showcase their branding. The Tampa Downtowner service was launched by the Tampa Downtown Partnership. The service provides free transportation throughout Tampa’s downtown area, spanning from the north end of Harbour Island to Interstate 275, and from the University of Tampa area to the Channel District. This service is on-demand and point-to-point. Rides can be requested through the Downtowner app, or hailed on the street. NovaCHARGE, LLC was founded in 2008 to address the need for a next-generation electric vehicle (E/V) charging infrastructure. 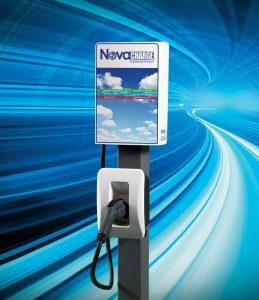 As a leading provider of E/V networked and non-networked charging solutions, NovaCHARGE is dedicated to enabling a better environment for future generations by supporting a zero-emission transportation infrastructure, offering convenient, affordable, grid-friendly charging stations that enable access across both public and private locations. NovaCHARGE is headquartered in Tampa, Florida, and is a Certified Minority/Woman owned business. For more information, please visit www.NovaCHARGE.net. Tampa Downtown Partnership is a private, membership based not-for-profit 501(c)6 comprised of companies, organizations and individuals with a common goal of advancing Tampa’s Downtown. Through an annual contract with the City of Tampa, Tampa Downtown Partnership administers the Special Services District. In addition to Tampa’s Downtown Guides and Clean Team, Tampa Downtown Partnership serves downtown through marketing, business development, transportation, advocacy, public space activation, planning and beautification. 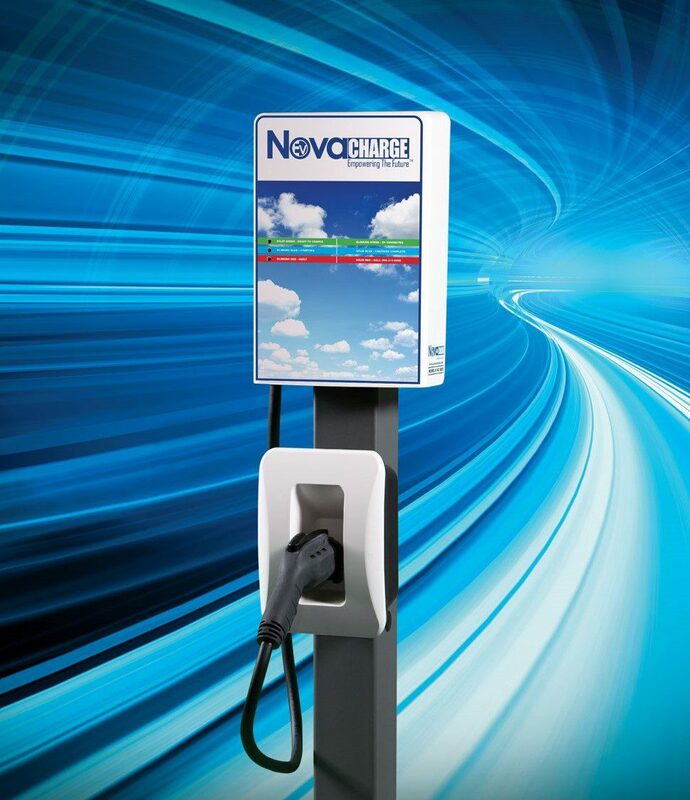 OLDSMAR, FL – August 2, 2016 – NovaCharge LLC, a leading provider of electric vehicle charging solutions, today announced the general availability of the NovaCharger NC-5000 series of electric vehicle (EV) charging stations. The NC-5000 series boasts a sophisticated, compact design, and features a customizable front panel enabling businesses to showcase their brand to its customers and employees. This level-2 EV charger features a rugged housing and a hardened rubber charging gun making the unit ideal for all weather environments. The NC-5000 line is built for heavy usage, and is available in both wall and pole mount configurations. These high performance stations rival competitive models, at a fraction of the cost. The NC-5000 line has been installed at a wide variety of customer locations throughout the U.S. over the past year. 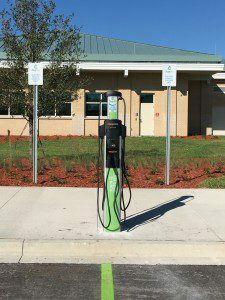 Most recently, Sarasota Bradenton International Airport (SRQ) selected the NC-5000 charging stations, installing four units in their short term parking lot allowing customers and travelers with EVs to easily recharge their cars. The EV charging stations are complimentary for SRQ customers parking an electric vehicle in the short term lot. About NovaCharge, LLC: NovaCharge, LLC was founded in 2008 to address the need for a next-generation electric vehicle (E/V) charging infrastructure. As a leading provider of E/V networked and non-networked charging solutions, NovaCharge is dedicated to enabling a better environment for future generations by supporting a zero-emission transportation infrastructure, offering convenient, affordable, grid-friendly charging stations that enable access across both public and private locations. NovaCharge is headquartered in Tampa, Florida, and is a Certified Minority/Woman owned business. It’s that time of year again! The 30% Federal Alternative Fuel Infrastructure Tax Credit is back! This tax credit is retroactive for 2015 and will extend to the end of 2016. So, if you purchased and installed an Electric Vehicle (EV) charging station in 2015 you may take this credit in April, 2016. Consumers who purchased qualified residential fueling equipment prior to December 31, 2016, may receive a tax credit of up to $1,000. Commercial entities may take 30% of the total cost of the project (including installation) with a maximum of $30,000.00. The tax credit is per site which means that multiple credits can be taken. https://www.novacharge.net/wp-content/uploads/2015/12/TaxCredits.jpg 304 415 Dawn Dixon https://www.novacharge.net/wp-content/uploads/2015/07/logo-novacharge-space.png Dawn Dixon2015-12-27 11:56:012016-08-01 16:08:06Federal Alternative Fuel Infrastructure Tax Credit is back! While its true that water and electricity normally don’t mix, an exception was made on Saturday in downtown Oldsmar. Despite getting off to a wet start under ominous skies, the weather eventually broke, and steady crowds turned out for the city’s second annual Drive Electric Tampa Bay event. Auto makers from Tesla to Toyota, BMW to Cadillac had electric and hybrid vehicles on display at the Oldsmar Public Library, and many people brought their own daily drivers to showcase along St. Petersburg Drive for the event that is one of only a handful of its kind in the greater Tampa Bay area. TEMPLE TERRACE — Owners of electric vehicles, accustomed to spending five hours or so to recharge their cars, will soon have seven new fast-charging stations around the Tampa Bay area that can fill their cars and have them back on the road in 30 minutes or less. Scores of electric vehicle chargers dot the landscape of the Tampa Bay area, but most of them are the slower models that take hours to recharge electric car batteries. The first of the Nissan Quick Chargers has been installed in the parking lot across from Temple Terrace City Hall, next to Outback Steakhouse, and is expected to be open for business next week. Tampa Bay is preparing for electric vehicles by adding more charging stations! The Nissan Leaf, the Chevy Volt, the Toyota Prius and the new Tesla – those are just some of the electric or hybrid vehicles zipping around Tampa Bay streets right now. One hurdle in the way of getting more plug-in vehicles on the road is more places to plug in. “Right now in Hillsborough County, we have about 150 charging stations, which compared to the number of vehicles we have on the road is minuscule,” said Helda Rodriguez, President of NovaCharge.